Hype surrounding Woodstock‘s 50th anniversary had reached such a fever pitch that yesterday evening’s line-up release feel rather flat. Rumors had all but confirmed The Killers, Dead and Company, Chance The Rapper, Imagine Dragons, and Santana as headliners. Then, another leak suggested Jay Z, Miley Cyrus, Halsey, and The Black Keys were to perform. 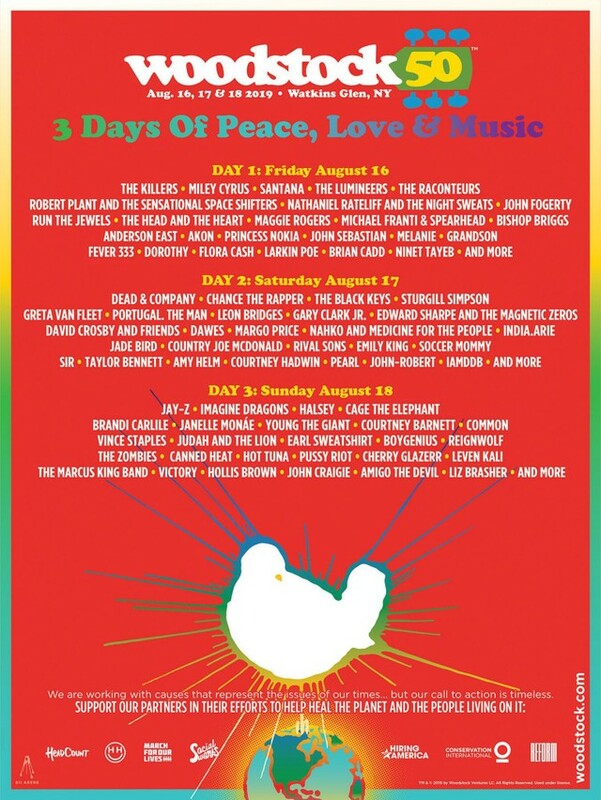 Now Woodstock co-founder Michael Lang has released the full line-up for “the festival that stated them all,” which confirms all previous artist bookings to be true. Other notable line-up additions include The Raconteurs, Run The Jewels, Greta Van Fleet, Portugal. The Man, Leon Bridges, Nahko and Medicine For The People, Cage The Elephant, Young The Giant, and more. The bill also includes more than a half-dozen artists who performed at the original 1969 festival, including Santana, John Fogerty of Creedence Clearwater Revival, John Sebastian, CSNY’s David Crosby, Melanie, Country Joe McDonald and Canned Heat. All in all, it’s a truly multi-genre, intergenerational experience, as previously promised by Lang and organizers. Tickets for Woodstock 50 will go on sale April 22. The event will take place August 16-18 in Watkins Glen in upstate New York. Complete information is available on the festival’s website.